Fall is in the air, temperatures are getting colder, and flu season is about to begin. 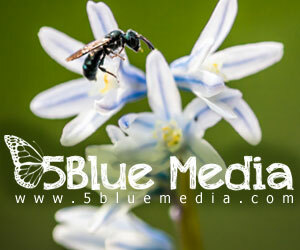 Soon, we will be seeing news reports about H1N1 and H3N1 swine flu outbreaks. But what exactly do these names mean? Notice how the Influenza A viruses also contain a separate designation, in this case either H1N1 or H3N2. Only Influenza A viruses contain this additional label, and increasingly, this is how they are referred to in the media. So what exactly does a name like H3N2 mean? Remember that the purpose of a virus is to hijack a host cell and make lots of copies of itself (see our Viral Life Cycle animation for more information). The genome of a virus may be either DNA or RNA (it is RNA in influenza) and it contains the instructions for making new viruses. The protein capsid encloses the genome. In influenza viruses, the capsid is surrounded by a membrane-like structure called an envelope. The spikes in this diagram are glycoproteins that assist the virus in identifying and entering its host cell. Now, lets focus on the H and N aspects of an influenza virus. Notice how in the diagram of an influence virus below that there are several different forms of glycoprotein spikes on the surface of the virus. For influenza A viruses, there are two important forms of these spikes – H spikes and N spikes. H spikes are associated with hemagglutinin, a type of glycoprotein that assists the virus in identifying the receptors on the host cell. The N spikes are an enzyme called neuraminidase. N spikes help break down the mucous material surrounding host cells in the respiratory tract and initiate penetration of the virus into the host cell. These spikes are not the same in all influenza A viruses. There are over 17 different known forms of H spikes, and 10 different variations in N spikes. These variations are what gives the influenza A viruses their distinct name. In humans, H1N1 and H3N2 are the two forms of influenza A the contribute to the normal seasonal flu outbreak. So, for example, the H1N1 virus has hemagglutinin form 1 and neuraminidase form 1. 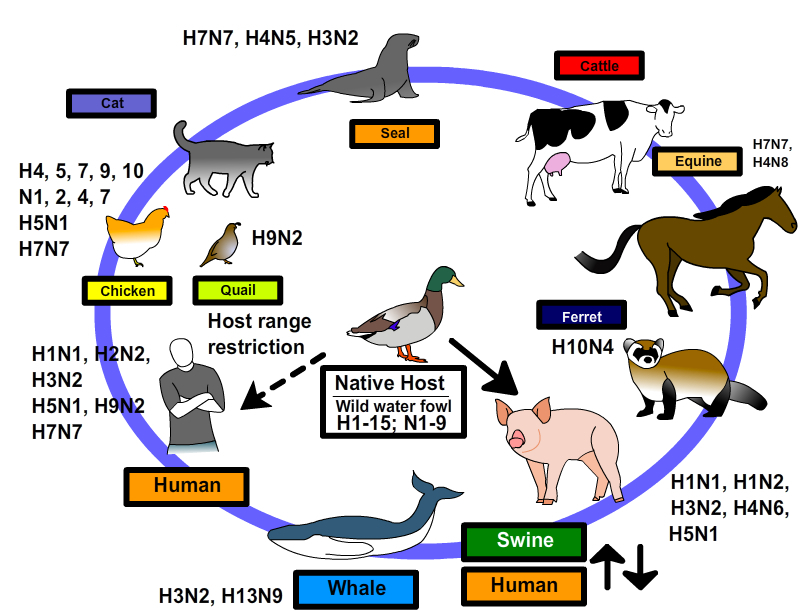 Notice that H5N1 (avian flu) has a number of hosts, while others (H13N9 – whales) are fairly host specific. Interestingly, birds are hosts for all variants of influenza A. These types of relationships help scientists identify not only reservoirs for the virus, but from where future outbreaks may originate. This post was updated in April 15, 2015 with new image information.